So much for that Nobel Peace Prize. What happened in Hanoi says a great deal about how Trump perceives his own negotiating skills. 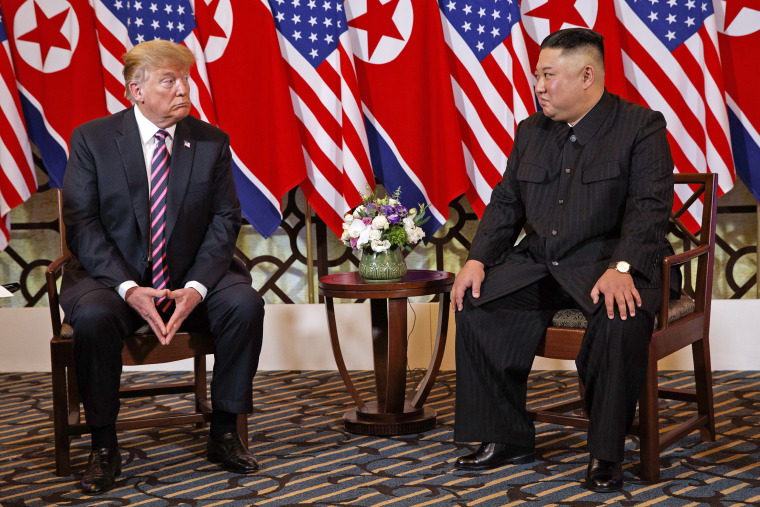 President Donald Trump’s apparent desire to be awarded the Nobel Prize for his negotiations with North Korea was one of the casualties of the Hanoi summit at the end of February. He likely reflected on that fact and what to do in the future as Air Force One headed home. Trump claims Obama told him that he was "so close to starting a big war with North Korea." The president has now travelled to Asia twice to meet with North Korean dictator Kim Jong Un and achieved virtually nothing. The vague goal of a denuclearized Korean peninsula — the essence of the Singapore communique — has yet to be clearly defined, and there is still no clear roadmap to achieve this objective. Indeed on Tuesday, NBC News reported that North Korea is pursuing the "rapid rebuilding" of the long-range rocket site at Sohae Launch Facility. There are many reasons for what has clearly been a massive foreign policy failure. Importantly, Trump has eschewed the traditional “bottom-up” approach to diplomacy. This approach allows diplomats to negotiate a myriad of issues prior to the actual summit, which is often largely a signing ceremony. In contrast, Trump reportedly brushed off warnings from advisors who claimed the North Koreans were unwilling to give up their nuclear stockpile, and even suggested the summit be postponed. To the chagrin of these experts, Trump remained convinced that he could achieve success due to his negotiating skills, force of personality and relationship with Kim. While Trump was always fighting an uphill battle, his latest failure will likely make future negotiations even more challenging. He was wrong. And while Trump was always fighting an uphill battle, his latest failure will likely make future negotiations even more challenging. Compromise will be difficult now that both leaders have personally staked out their respective lines in the sand. Thus, what happened in Hanoi ultimately says a great deal about how Trump perceives his own negotiating skills. But it also offers more clues about what exactly it is the enigmatic Kim Jong Un wants. The president went to summit with the goal of trading the removal of U.S. sanctions for the complete elimination of North Korea’s nuclear capabilities. Kim was not willing to accept this plan. In his press conference, Trump stated that Kim insisted the U.S. should remove all sanctions in return for the DPRK closing the Yongbyon nuclear complex, which the president deemed insufficient. The North Koreans disputed this description and claimed they only sought a partial removal of sanctions. Clearly, there were major misunderstandings and false assumptions on both sides. Kim may have believed that Trump needed a win after months of significant pressure and political setbacks at home. It also appears that the North Koreans were surprised by what the U.S. delegation knew about secret North Korean facilities. Was Trump's diplomatic team ready for North Korea meeting? One of Trump’s biggest mistakes was his assumption that Kim needs the U.S. to dramatically improve its economic situation, and thus the nukes for sanctions trade makes sense. This is not accurate. An improved economy is not an ends for Kim, but rather a means. He clearly wants to stop the economic strangulation of his country, address widespread malnutrition to avoid social unrest and gain access to Western goods and technologies to modernize his military. But his primary goal is to maintain his iron-clad control over the regime. He may wish to end starvation in his country, but the transformation of North Korean society that might result from dramatic economic development and greater access to the West could have catastrophic consequences for the dictator. Kim is a smart man with an understanding of history. He very likely recalls Mikhail Gorbachev’s effort to restructure the Soviet economy and provide greater transparency for its population, an effort which led to not only his demise but the end of the USSR. The North Korean press also covered the demise of both Moammar Gadhafi and Saddam Hussein. The lesson was clear: Forfeiture of a nation’s nuclear weapons program was an invitation for destruction. Instead, Kim Jong Un probably hopes that eventually the DPRK can emulate India and Pakistan. Both countries acquired nuclear weapons in the 1990s and were initially declared international pariahs for their failure to subscribe to the Non-Proliferation Treaty (NPT). Over time, however, their status as nuclear powers has been accepted by the international community. This historical context seems to have escaped Trump, however, if not his foreign policy experts. The calculations have changed. Robert Gates, former secretary of defense in both the Barack Obama and George W. Bush administrations, once said the three words most infrequently uttered in Washington are “and then what?" Trump and his advisers are certainly considering this question now that it seems unlikely a third North Korea summit is going to happen anytime soon. But while the original goal of the summit is now out of reach, Trump can absolutely make the existing situation worse. To make sure this doesn’t happen, he needs to do several things. First, he needs to avoid the rhetoric of “fire and fury” or “little rocket man.” Insults have gotten Trump nowhere. Instead, a return to the more tedious bottom-up approach of diplomacy is now warranted. Such efforts could focus on intermediate goals such as confidence-building measures, exchange of liaison missions to respective capitals and discussions about broader security concerns such as proliferation of weapons of mass destruction by North Korea, etc. The administration might even consider reviving the so-called six-party talks that included the U.S., South Korea, DPRK, China and Russia. Trump must also work to continue to reassure U.S. allies in the region. South Korean President Moon Jae-in is likely very disappointed by the failure to achieve an agreement. He has staked his political future on improved relations with the North following two meetings with Kim Jong Un and a historic trip to Pyongyang. Moon is likely going to press the Trump administration to allow inter-Korean economic development and humanitarian assistance outside the existing sanctions. Many Japanese leaders on the other hand were concerned that the Trump administration would ignore their concerns about North Korea’s short-range missiles that threaten Tokyo in a desire to achieve a breakthrough. Japan and South Korea remain not only two of America’s closest allies but also very important trading partners. Disputes with these allies over trade coupled with the surprise announcement that the U.S. would be ending large-scale joint military exercises with South Korea have strained relations. Kim knows this and will likely attempt to exploit any weaknesses in the diplomatic fabric. China’s role in the situation is particularly important. North Korea will portray itself as an aggrieved party who sought peace with the United States and was frustrated. Furthermore, the Singapore and Hanoi summits have elevated Kim on the international stage and may make maintenance of international support for sanctions even more difficult. Trump’s upcoming trade meeting with President Xi Jingping of China will be critical in this regard. The leaders will undoubtedly discuss North Korea as Chinese support for the sanctions is essential if the U.S. is going to maintain pressure on North Korea. Winston Churchill once remarked “to jaw-jaw always is better than to war-war.” Trump deserves credit for initiating a dialogue with North Korea that had been absent for many years. He claims to have created a “special relationship” with Kim who, at 35 years of age, could rule North Korea for decades to come. But the problem that is North Korea remains after Hanoi. In every crisis there is often an opportunity, and the Trump administration must now create a more holistic approach as it continues to work with Pyongyang and negotiate the changing nature of international security in northeast Asia. This will require painstaking discussions on not only about nuclear weapons but also proliferation, the conventional threat North Korea poses to the South Korea, DPRK arms sales in Africa and the Middle East, as well as Pyongyang’s abysmal human rights record. None of this will be achievable, however, until the Trump White House stops treating diplomacy like an episode of “The Apprentice” and tries to actually figure out what motivates the North Korean leader. Jeff McCausland is a retired U.S. Army colonel and national security consultant for CBS Radio. He commanded a battalion in combat, was a member of the National Security Council in the White House, and Dean of the U.S. Army War College.